Jaffna Fort, the second biggest Dutch fort built in Sri Lanka, is an archaeological monument, situated on the South side of the Jaffna peninsula. The layout of this fort resembles a geometrically regular pentagon and consists of the defense works built of high ramparts and bastions. There is a deep and a wide moat surrounding it, the shape of which resembles a star. 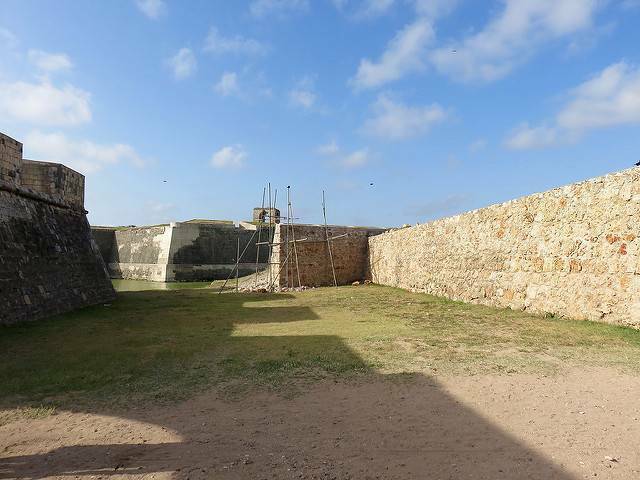 This fort is the only fort in Sri Lanka whose inner defense walls resembles a geometrically regular pentagon. The Jaffna Fort was originally built by the Portuguese in 1619. It was later rebuilt and expanded by the Dutch in 17th and 18th century to boost the trading activities of Sri Lanka. It is because of this reason that it is known as a Dutch Fort. This fort holds many buildings which are of great architectural significance. The Fort is a major example of how a place with such less outer ornamentations can achieve architectural importance with just the right proportions between the interior as well as the exteriors. Having a dominating façade, it is a very prominent structure in the area. Most of the original structure has been destroyed due to the wars ravaging in the area and only a little of the architecture still remains. A must visit place, to experience the great history and architecture of the Jaffna Fort!